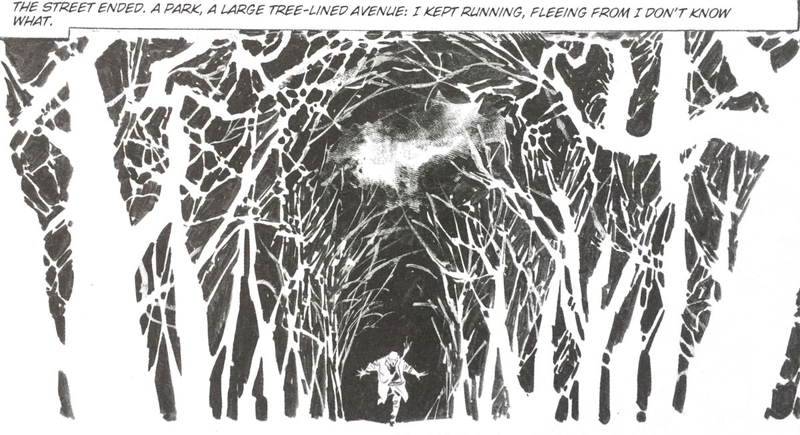 Reprints show the roots of things you run into again elsewhere—it’s one thing to hear that Frank Miller and Jim Steranko were influenced by Guido Crepax, another to see the original Valentina work they were looking at—but the Alberto Breccia art in Fantagraphics’ new restoration of Mort Cinder from 1962 seems influential and almost impossible to appropriate at the same time. The deep shadows and high contrasts point at the usual noir suspects on film and someone like Gene Colan on the page, while the drawing techniques appear so improvised that the art might sit outside of a mass-production industry altogether. Every delicate shade and stipple and harsh stamp and smudge would be individual even if Breccia didn’t leave his actual fingerprints in the ink—which he does, a thumbprint serving as the Moon in the sky. Meanwhile the story keeps leading the immortal Mort and his loyal old sidekick Ezra into liminal zones of all kinds—fog banks, night-time forests, overgrown paths, tunnels, jungles—and the Breccia art veers towards the abstract before diving into it fully. The real world and parts unknown rub shoulders all the time, just a tense walk in the fog away. Writer Héctor Germán Oesterheld ultimately vanished into a grave somewhere in the fog at the hands of the Argentinian junta, just to make the symbolism even more acute. In ancient Babylon an alien scientist who looks like a leper fires an invisible beam at the Moon so that the reflected rays will return to Earth and alter the human mind to make communication impossible and so slow the pace of technology. And this is what Breccia draws.